To me, most of the sword and sorcery fantasies follow the same storyline. 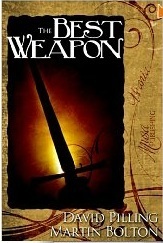 The Best Weapon, on the other hand, offers a new twist on the genre with a tale with an original plot. In this world, gods are petty, selfish beings more intent on their own position amongst the others. The Lords of Hell are twin demon brothers, two scheming, conniving beings. When the brothers perceive an approaching threat, their only recourse is to create two brothers out of clay and place them into the wombs of woman at opposite sides of the world where they will grow and mature until the demon brothers can make use of them. One brother, Naiyar, is born into the Djanki tribe, a fierce, warlike people, bent on conquest. The other brother, Fulk, is born to a woman in the far north where the remnants of the Old Kingdom have taken root. Orphaned at an early age, he is taken in by the Knights Templar, and ancient order dedicated to supporting the rightful king. Or at this time, the infant queen, the king recently dying with no male heir. Through trials and tribulations, events point to the brothers meeting, but what they might do then is unknown. The rhythm and tempo of the book flows well, despite bouncing back and forth between the two brothers and some assorted characters such as the Archpriest Flambard, the regent of the Old Kingdom. The character voice is appropriate, and the details of this world are well thought-out and logical. One point I liked was the transformation of the Archpriest from a scheming, but not horrible man, to someone evil after being "touched" by one of the Lords of Hell. With only a few sentences here and there, the fact that this is a transformation out of the Archpriest's control is evident. I also liked the fact that the various characters had their own individual voices and speech patterns. Too often, each character in a book speaks with one voice, that of the author. But in this book, I could read a quote and recognize the character. The two brothers, in particular, ahd their own identities (I wondered that as the book has two authors, if each one took one of the brothers and penned his dialogue.) Of course, by making them different, they came across differently. I felt that of the two, Naiyar was the more colorful, complete, and complex character. William Mallet, the Master-at-Arms for the Templars was perhaps my favorite character. Initially seeming to be a callous tyrant, the authors gradually coaxed out a fuller picture of an honorable and brave man. We were never directly told this, but his true character was revealed by his actions. The language was slightly stilted, as is common in this genre, but not overly so. I also had a problem with people blindly following the Archpriest when his physical condition had deteriorated. But overall, this was a very enjoyable, captivating novel. I heartily recommend it to anyone. For more reviews or to buy The Best Weapon from Amazon.com, click here.